Surname Saturday – This week it’s the turn of the FLOWER family of Cambridgeshire – an unusual surname, that took on a harrowing battle at home. The Flower family appear in my maternal ancestry – with its most recent name bearer being my 7x Great Grandmother, Frances Flower. Frances was born in 1731, and was the oldest of five daughters born to William Flower and his second wife Phillipa Thorpe, who had married the previous year at Wicken parish church, Cambridgeshire, England. 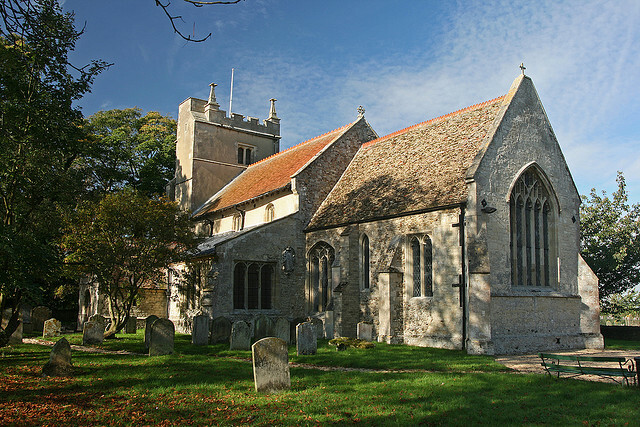 St. Laurence’s church, Wicken, Cambridgeshire, would have been a familiar sight for the Flower family. Photo: Steve Day via CreativeCommons. William’s first marriage to Jane Diss on 3rd November 1715 at Wicken, had produced six children – the last, Thomas, born not long before Jane’s death in 1728. Jane’s death left William with five young children, all under the age of 12 years old. Having re-married to Phillipa in 1730, the couple settled down to raise five children. Frances was baptised at Wicken on 13th June 1731. Frances married at about the age of 21, on 30th March 1752, to widower Richard Bayley, who also lived in Wicken. The couple settled down and had nine children. Frances’ parents, lived until their 50s/60s, but the Wicken burial register notes ‘coll’ as the cause of death. I’m pretty convinced that this note, which appears alongside several other entries, suggests that there was an outbreak of Cholera in the village. There are eight recorded ‘coll’ victims in Wicken in 1785-1786, and five of these were in the Bayley family – suggesting a contagious disease, which my other initial thought of ‘Colick’ is not (obviously, I am no doctor). Both Frances and her husband, their son and daughter-in-law, and another married daughter, all died as a result of ‘coll’ within the space of five weeks. Millions of people still die from cholera each year, but unlike those in the 18th Century, we can now treat the disease to help reduce that figure. Cholera in Wicken might suggest that there was poor water sanitation in the village, or that the Bayley family had low food hygiene standards. It is sometimes linked to poverty.